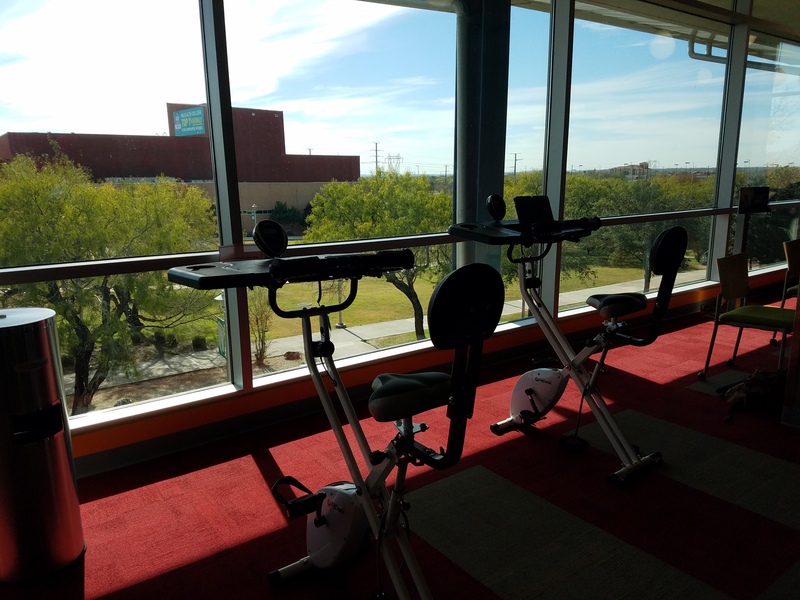 Study and work out at the same time in the Ozuna Library. Photo by LeAnne Noguess. When most people think of a library, they only think about books, but the Palo Alto College Library has more to offer than that. Tosca Gonsalves, Database and Electronic Services librarian, gave some insight on what services are given. Sophomore Quinn Picard did not know that students can also check out textbooks for two hours to study. “That’s awesome, and I would be interested in trying that out from time to time,” she said. Most professors put their textbooks on reserve in the library for their classes. Sophomore Journalism/Mass Comm major Juan Ponce Jr. said that he only knew about the online catalog and eBooks and checking out textbooks and materials for classes, like laptops and tablets. Many students know about checking out books and the study rooms, but the library also offers students ways to take a break or wind down from studying and the stressors of school. Another service that the library offers has to do with finals. “Starting on Sunday Dec 9. through Wednesday Dec. 12. We are open until midnight. We also offer free printing and tutoring that will be available in Room 217 in the library from 6 p.m. to 9 p.m. in Math, Science, and Writing. Another note: we will still be closed on Saturdays,” said Gonsalves. The Ozuna Library and Learning Center is located at 1400 West Villaret Blvd. on the second floor. The hours are Sunday from 1 p.m. to 9 p.m.; Monday through Thursday from 8 a.m. to 9 p.m.; Friday from 8 a.m. to 5 p.m.; and closed on Saturdays. The Children’s Library is at the same location but on the first floor. Their hours are Sunday from 1 p.m. to 5 p.m.; Monday through Thursday from 9 a.m. to 8 p.m.; and closed on Fridays and Saturdays. You may also look on the library homepage for holiday/special hours.